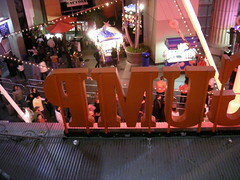 Due to the outrageous door fees for most of the New Year events here in Los Angeles, a few girlfriends and I ended up at CityWalk, which is Universal Studios’ attempt to squeeze some cash out of the townies in addition to the piles that they’re raking in from the tourists on the studio tour. Last night, they were featuring two bands, fireworks at midnight and most importantly, it was free and close by since no one wanted a long drive home. The plan was to get there before the restaurants started charging covers to enter (seriously? $50 door fee at City Walk? Come on, people), have some dinner and then mill about and enjoy the cheesy ’80’s band until the big moment. Although the dinner plan went well, City Walk was packed – guess we weren’t the only ones balking at a paying a cover charge, so we went to the upper level to move a bit faster, and that’s when I took this photo from behind the corporate seafood place’s sign. For the record, we had corporate Italian food for dinner. Not that great, but there was a lot of it and since we ate at the bar we managed to bypass the 1 hour wait for a table. The band were fun and a good time was had by all. Happy 2010, everyone. Let’s all hope it’s a damn sight better than 2009 was.